Fostering the closer relationships and superior experience that lead to customer loyalty isn’t good just for a brand’s reputation; it’s good for its bottom line. It can have a significant impact on a company’s continued profitability, with repeat customers driving sales as well as assisting new customer acquisition. And yet organizations on the whole are slow to wake up to the bottom-line benefits of attracting customers for life, and even slower to allocate the resources necessary to do so. To shed light on this issue, Forbes Insights, in association with Sitecore, conducted a survey of 312 senior executives based in North America in July 2014. The respondents represented a broad range of industries. All companies represented had at least $500 million in revenue; 30% had $1 billion to $9.9 billion in revenue; and 19% had $10 billion or more in revenue. 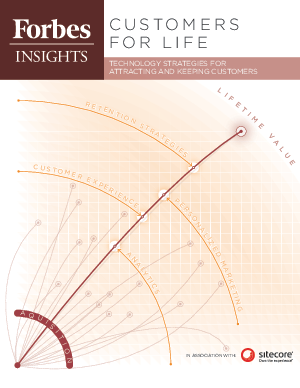 In-depth interviews with senior executives and experts add context to the data.